It doesn’t matter what kind of life you lead; eventually, your shoes are going to get dirty. Fortunately, by just cleaning your shoes on a regular basis, you can remove the excess dirt and grime that often accumulate on your footwear through daily use. 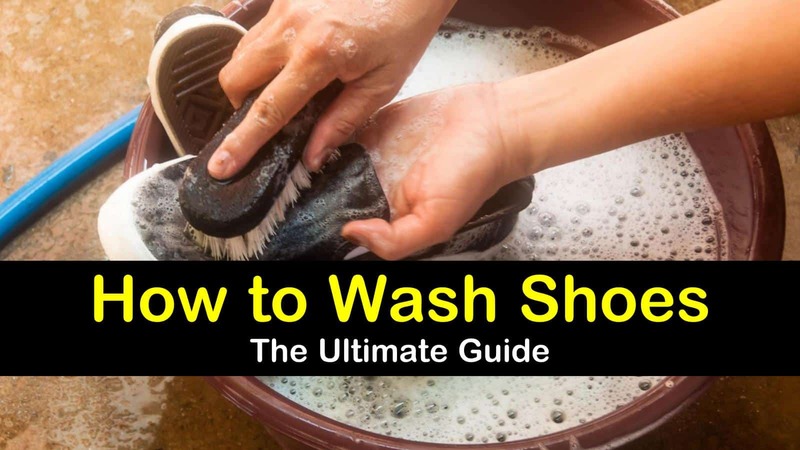 How you wash your shoes will depending solely on what kind of material they are made from, what products you have on hand, and how much time you have to spend. Learn how to wash shoes with these practical techniques. Whether you’re looking to clean your sneakers, leather shoes, UGG boots, or heels, here are some simple cleaning techniques to get your footwear looking sparkling clean once again. These easy cleaning techniques use everyday products that you can find at your local store. Here’s how to wash a pair of shoes at home with everyday products. Before you throw your shoes in the washing machine, it’s important to know that you shouldn’t clean all your different types of shoes in the manner. Shoes that contain animal-based materials, like leather and suede shoes, will be damaged, so it’s best to clean these kinds of shoes by hand. This is also true of shoes that contain delicate materials like silk or satin, or those that have embellishments. Tennis shoes, running shoes, and canvas shoes can all be safely cleaned in the washing machine because they are made of durable textiles like cotton, polyester, and nylon. Save yourself some time and skip hand washing these types of shoes, and machine-wash them instead. Before you wash shoes in the washing machine, be sure to check the care label to see whether or not you can clean them in the washing machine. Start by removing the laces an insoles from the shoes. Use a soft bristled brush, an old toothbrush to remove any loose dirt from the surface. To remove stubborn dirt, hold the shoes under warm water to remove stains and excess debris. Doing this helps washing machines do the job more efficiently. Add a mild laundry detergent and wash in cold water on a gentle cycle. The water temperature should be no hotter than 86 degrees Fahrenheit to prevent the colors of your shoes from fading or running. Remove the shoes from the washer and allow to air dry. Avoid drying them in the dryer, as the high heat might cause the glue to melt, which will leave your shoes vulnerable to breaking. Place them in a well-ventilated area and place newspaper or paper towels inside to help absorb excess moisture and help your shoes keep their shape. If you don’t want to risk running your shoes through the wash cycle in your washing machine, you can always take the time to hand wash your sneakers and other kinds of shoes. Hand washing will take a bit more time than washing them in the washer, but they’ll come out just as clean, and you’ll reduce the risk of damaging them. >> Further tips on show cleaning: Can you wash vans®? To clean your leather shoes, start by using a dry, soft cloth to dust off any dirt or debris. Next, combine equal parts white vinegar and hot water. Dip the cleaning cloth into the solution and gently wipe the shoes down. Allow them to air dry. After they’ve dried, rub them down with a soft, clean cloth. To remove scuff marks, dip a wet rag in baking soda and buff away the scuff marks. More on how to clean leather boots here. Wipe the shoes off to remove the residue, then buff once again after the shoes are dry. There is nothing quite as embarrassing as showing up to work with your patent leather heels or flats covered in unsightly scuff marks. You can quickly remedy this problem with a little petroleum jelly. Using a cotton swab, apply some petroleum jelly to the scuff mark. Then you can use a little spray of window cleaner to bring back the like-new sheen. Cleaning suede shoes with its rather delicate material can be quickly damaged if not cared for properly. Unlike other materials, water can create unsightly stains that are difficult to remove. Here’s how to clean your suede shoes to get them looking new again. Use a nail brush or scrub brush to gently buff stains away, being sure to work in one direction. After you’ve removed the surface dirt, add a bit more pressure to the brush and work at deep stains, moving back and forth with the brush. If the stain is particularly stubborn, you can follow up by scrubbing the stain with a white eraser. When dealing with particularly tough stains, take a white washcloth, dampened with white vinegar or rubbing alcohol, and attack the stained area. You can also run the damp washcloth across the surface of the shoe to brighten the suede. This method will also work for cleaning sheepskin boots like your favorite UGGS. Canvas shoes are made from fabric, which means they can get pretty dirty if not adequately cleaned and maintained. However, you don’t want to toss them in the washing machine because the glue that holds them together can seep out of the shoes when exposed to too much water. Start by using an old toothbrush to wipe the dirt off the surface of your canvas slip-on and tennis shoes. Then create a paste of equal parts water and baking soda. Using the old toothbrush, scrub the paste into the soles of the shoes. Next, fill the sink or a large bowl with water and add a mild soap or liquid detergent. Swirl the water to create suds. 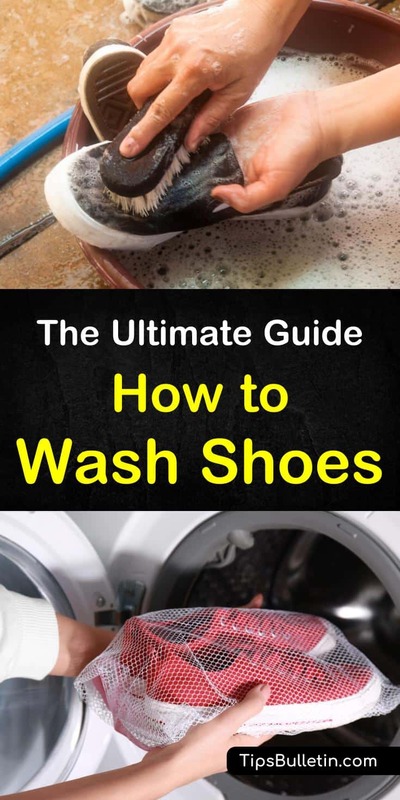 Remove the laces from the shoes and swirl them around in the soapy water. Rinse them with warm water and hang them up to dry. Take a nail brush or toothbrush and dip it in the soapy water and begin to clean the shoes, gently scrubbing the canvas. Next, dip a sponge or cloth in clean water, wringing out any excess water. Lightly sponge the canvas with the damp cloth to rinse the remaining soap residue off. Be sure you don’t soak the shoe in the process. Absorb any excess water by pressing a clean towel over the shoe. Let the shoe air dry. If you use your running shoes on a regular basis, they can get pretty dirty, here’s how to wash running shoes by hand with a mild detergent. Start by using a toothbrush to remove any loose dirt from the shoe’s surface. Clean the brush thoroughly, then dip it into a solution of a teaspoon of laundry detergent and a cup of water. Gently scrub the mesh, fabric and rubber areas with the brush, being sure not to use it on any areas that are leather or foam. Then, use a wet sponge to wipe off the remaining suds and allow to air dry. The quickest and easiest way to clean your shoelaces is to clean them in the washing machine. Start by taking the laces out of the shoes. Next, place them in a mesh laundry bag or pillowcase. Then, just toss them in with a load of dirty laundry. When the wash is complete, take the laces out of the bag and air dry. The best step you can take when trying to clean muddy shoes is to get as much of the mud off the shoes as possible, before washing them. Try stomping or wiping them on the grass or rug to help remove a significant amount of the dirt. Then you need to let the mud dry on the surface. Allowing the mud to dry will help you brush it off easier without damaging the fibers of the shoes. You can use a nail brush or an old toothbrush to help you remove the mud from the side and bottom of the shoes. You can also try to get rid of the dirt by turning a high-pressure hose on the shoes, spraying them directly to get rid of as much mud as possible. After removing as much as the mud as you can, you can continue to clean the shoes with a little soapy water. Add a bit of washing detergent to a bowl of water, and use a cloth to gently wipe the soapy mixture into the muddy areas of the shoe. Then, take another clean, damp cloth and rinse the excess soap from the surface. Finally, place some crumpled newspaper in the shoes and let them air dry. No matter how careful you think you are, your shoes are bound to get dirty and need cleaning after a while. These simple techniques for cleaning any shoe should help you get all your footwear sparkling clean. Just follow the direction for the kind of shoe you have and enjoy wearing shoes that look brand new. We hope you enjoyed learning how to wash shoes with many simple techniques and everyday ingredients. If you found the information in this article useful, please don’t hesitate to share it with all your friends and family.